A SPECTRALIS OCT ophthalmic imaging device from Heidelberg Engineering is currently on its way to the International Space Station (ISS). 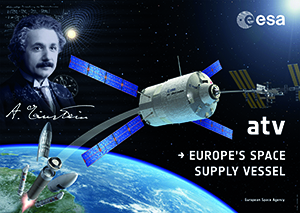 The SPECTRALIS took off from Europe’s Spaceport in Kourou on June 5th in the European Space Agency’s (ESA’s) Automated Transfer Vehicle “Albert Einstein” (ATV-4) atop an ARIANE 5 rocket. ATV-4 is scheduled to dock on the ISS on June 15. Soon thereafter, ISS crewmembers will use the SPECTRALIS for detailed examinations of the back of their eyes. This endeavour is part of a high priority NASA program to study the etiology of recently discovered ocular changes in astronauts after space flight, and to mitigate potentially sight-threatening risks for astronauts on long duration missions. NASA has purchased several SPECTRALIS OCT devices from Heidelberg Engineering to examine astronauts before, during and after space missions. SPECTRALIS baseline examinations of ISS crewmembers were acquired during the last few months in Houston, Texas.